This month, we chatted with RV podcasters, bloggers, and authors, Jeremy & Stephanie Puglisi. What started as a love of road-tripping to iconic events and places like the New Orleans Jazz Fest and cross-county while they were dating has morphed into an RV career for husband-and-wife podcasting and blogging team, Jeremy and Stephanie Puglisi. It’s now a way for life for their burgeoning family of five. After the birth of their twins, Max and Theo in 2009, the pair made a promise to each other to keep having adventures and not let parenthood slow them down. Seeing a “Go RVing” ad sealed the deal by prompting them to purchase a pop-up camper and start traveling with the kids. They were smitten on the first trip and ended up spending 25 nights on the road that year. 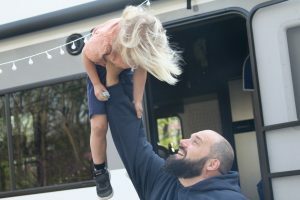 Several years later—and with an upgrade to a Jayco White Hawk travel trailer and then a Jayco Octane Super Lite Toy Hauler, as well as the birth of another son in 2013—the Puglisis now spend more than 75 nights on the road and have turned their love of campgrounds and RV culture into a thriving family business. With backgrounds in education, writing, and teaching, their venture started out with some writing for Jayco’s blog. With that success came the natural move into the creation of their own blog, RV Family Travel Atlas. Instead of teaching students about Shakespeare and Homer, they found themselves teaching their blog readers about RV and campground culture. Around the same time, the Puglisis decided to try their hand at podcasting, basically expanding their blog’s reach. The RV Family Travel Atlas podcast is a general interest radio show about all things camping and RVing and can be found on iTunes, Stitcher, or on their website (www.rvfamilytravelatlas.com). 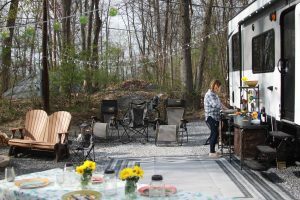 Featuring topics like favorite activities for family bonding, getaway ideas, tips for a successful escape, and even what kind of RV might be right for creating your own adventure, they have been producing a new episode every week for the past three years. The show has been a huge success and has become one of the top-ranked travel podcasts in the iTunes store. 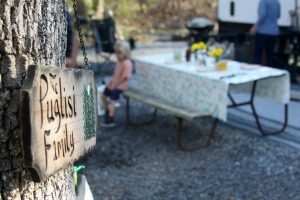 That success has led the Puglisis to expand to an additional Campground of the Week podcast, as well as Stephanie’s joint venture of the Girl Camper: Going Places and Doing Things podcast with host, Janine Pettit. All three now comprise the RV Family Travel Atlas Podcast Network, with more than 1 million downloads in the iTunes store. If that isn’t enough, the Puglisis also write magazine articles and blog for many RV-oriented clients including KOA, Go RVing, Cabela’s, Progressive Insurance, Good Sam Travel and Savings Guide, and others. They have also recently become spokespeople for Go RVing, with live interviews on various news sources and publications. They are also members of the Cabela’s Pro Staff as representatives for family camping. And, in 2016, they wrote the Idiot’s Guide to RV Vacations, published by Penguin/Random House (available on Amazon). They are currently working on their second book. They are also active in philanthropic RV endeavors. Recently, they helped to raise $10,000 from their podcast listeners to buy a travel trailer for the Tents for Troops RV Loaner Program. The RV will be placed permanently at a campground exclusively for the use of active duty soldiers and their families. The RV they are purchasing with the funds will be the first one in the “pay it forward” program. We recently caught up with Jeremy after a family trip exploring the Pacific Northwest. What do you love about RVing? For our family, it’s been transformative. Life gets really stressful at home—my wife works, I work, the kids have school, the kids have sports. And even when we’re home, we’re in different rooms. When we go on an RV trip together, we come closer together as a family and we spend real quality time together. We get out into nature as well, which is also great. We do a lot of hiking and kayaking. Is RV Family Travel Atlas a full-time job for both of you? We both worked as full-time teachers for over a decade. Two years ago, we had a make or break moment when we realized the business was blossoming and we decided that Stephanie needed to quit her job and manage the business full time. She is the producer of all three podcasts and has strong managerial skills. I have continued teaching but have cut back substantially teaching AP English and film at a private school which allows us to travel a lot. What’s your favorite thing about travelling in an RV versus staying in hotel? Campgrounds are incredibly friendly places and we love meeting other travelers. This does not happen at hotels. We also love having our own bed, kitchen, and bath. [And] not having to sleep in beds others have slept in. Also, we love to escape into nature—which is more likely to happen at a campground. I do the driving but only because Stephanie is a much better navigator and better at keeping the kids entertained and fed. What are a few of your favorite things onboard? My favorite thing onboard is my elaborate world class coffee set up—a Bonavita coffee maker and Encore burr grinder. I make the best cup of coffee at the campground. Period. Stephanie loves her Instapot crockpot and now her Cabela’s outdoor kitchen for cooking outside. Wesley loves bringing his stuffed animals and the boys love bringing their books and a complete supply of baseball gear for playing at the campground. We love Acadia National Park, Cape Cod, and all of New England. We also love Olympic National Park and the Pacific Northwest. We love the combination of ocean and mountains in one place. Any camping rituals that you and your family have or do? Morning coffee and a quick light breakfast and then a gorgeous hike. Then back to the campground to relax in the afternoon and a campfire at night. Repeat. What are some of your favorite meals that you make onboard? Stephanie’s Chicken Caesar salad is amazing—as is her pulled pork. Weenie roasts over the campfire also works. Any favorite restaurants on the road? Lobster shacks in Maine or Cape Cod for hot buttered lobster rolls! See our book for more. What’s the funniest thing that ever happened while you were RVing? Something funny happens in our RV every five minutes. Currently the boys are making up love songs for their dog Maggie. We call her Maggie the camping dog. Embark on an RV adventure of your own! Take the first step by visiting our website, thousandtrails.com.